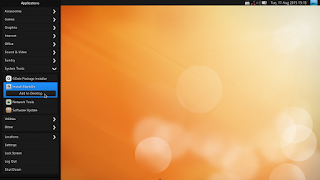 Manokwari is a desktop environment from Blankon Linux. 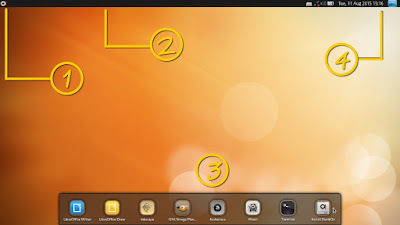 Manokwari is a lightweight desktop with unique user interface. It is suitable for old computers. This article will tell you how to use Manokwari for daily purpose. I use Blankon 9 Suroboyo for this article. 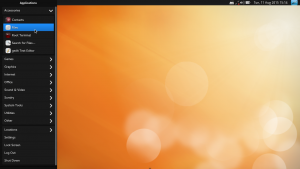 Manokwari has GNOME 3 basic layout. 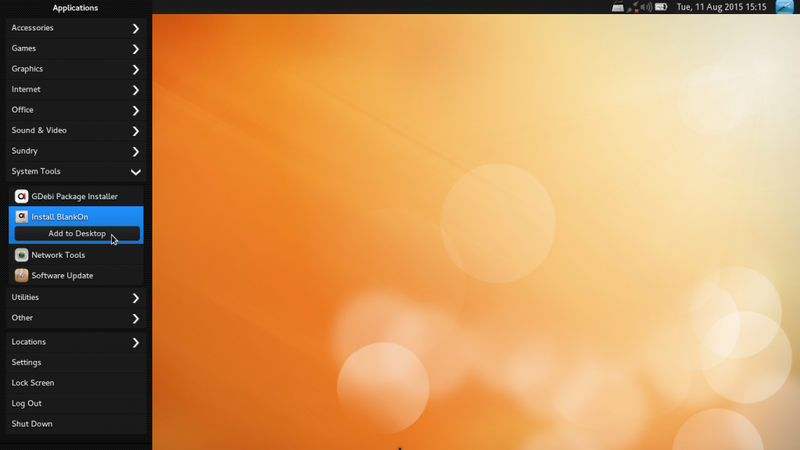 You find only top panel (contains menu, taskbar, and system tray). Manokwari has its own desktop shortcut system, very different with Windows. Manokwari has its own menu, very different with Windows even with GNOME 3 itself. To launch an app on Manokwari, open menu > select one category > select one app. Manokwari has no search bar. To create a shortcut, open menu > select one category > right-click one app > Add to Desktop. A new shortcut will appear on the bottom special panel. That is a panel for shortcuts. That is Manokwari desktop shortcut system. To delete a shortcut in Manokwari, you can't simply just right-click > Delete it. you should drag one icon into a trash icon on top of it. Manokwari is a unique desktop. 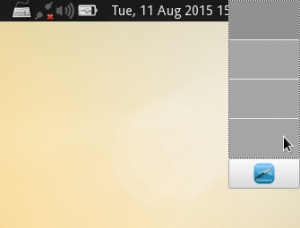 Manokwari taskbar, if you hover your cursor over a running app, a new black horizontal panel will appear. That black panel is tooltip. It is because Manokwari taskbar shows only the icons. The black panel helps you to distinguish between icons. 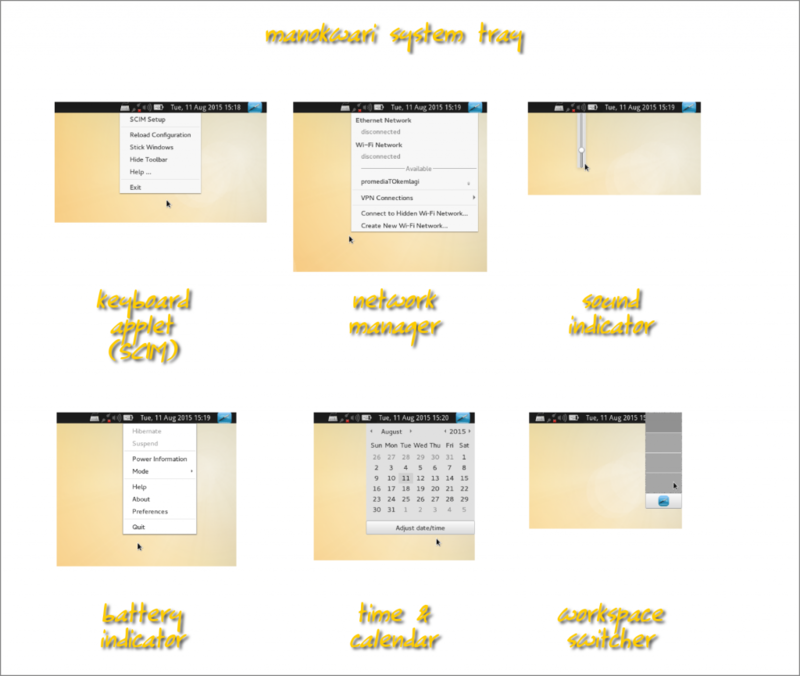 Manokwari has multiple desktop since the beginning. You have 4 desktops by default. To switch between desktop, use workspace switcher on the top-right of screen. To move a window into another workspace, right-click on its icon on the taskbar > Move to Another Workspace > select number. Keyboard input controller (SCIM). Manokwari has it to switch between Indonesian regional input systems. Network manager. You connect to a network by this. Sound indicator. You control sound volume by this. Battery indicator. If you are using laptop, it will represent your battery power. Workspace switcher. If you want to switch between desktops.